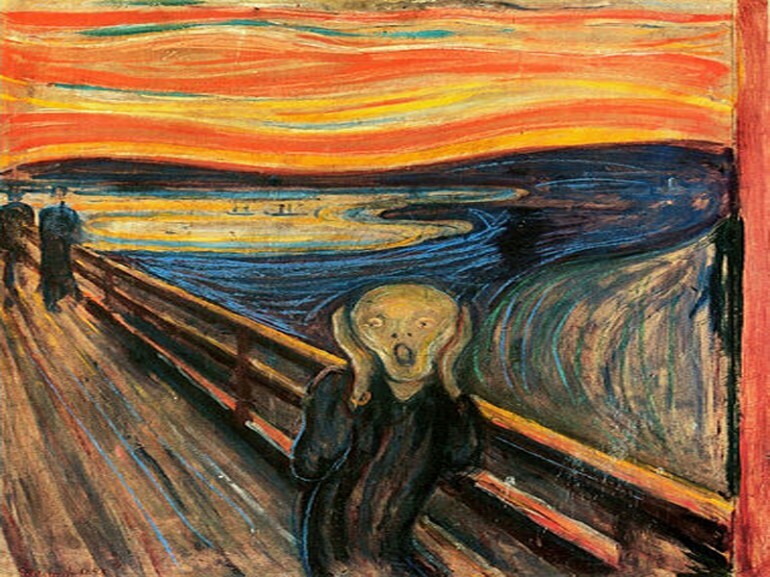 Was There a Real Volcanic Eruption in The Scream by Edvard Munch? This question is nothing new but somehow it’s worth revisiting, especially with the recent explosions of a number of volcanoes in different parts of the world. There’s Indonesia’s Mt. Kelud and Guatemala’s Pacaya volcano, among the more recent ones. Could nature’s wrath be the inspiration in one of the world’s most famous and most enigmatic works of art? Edvard Munch’s The Scream is said to depict extreme emotions while a huge natural catastrophe was observed although art scholars refute this idea. Was there really a volcanic eruption in The Scream? Why are there still people who think that The Scream has a volcano in the background believed to be responsible for the supposed scream of fear or panic depicted by the painting? The combination of red, orange, yellow, and some other colors representing the sky in the painting is said to be caused by the powerful eruption of the Krakatoa volcano in 1883. The volcano is located in Indonesia, then called the Dutch East Indies. The eruption was very powerful and enormous that it was said to have caused tumult across distances. The manifestation of the dust and ashes in the atmosphere was said to have lasted for months, up to 1884. …but the painting was created in 1893? Yes, the painting may have been created in 1893 or ten years after the actual Krakatoa eruption, but there are those who argue that it was only inspired by the event. Edvard Munch may have created the painting from memory. This is not really impossible considering that Munch actually produced four versions of the painting. One of which is a translation to a lithograph created in 1895. …but the explosion happened in Indonesia and The Scream was painted in Norway? It’s actually not impossible for the effects of a volcanic eruption in Indonesia to be visible from a distant European country like Norway. Researchers in Sky & Telescope are leaning towards the idea that the fiery sky depicted in The Scream could be the result of a major volcanic eruption. The scale of the 1883 Krakatoa eruption is believed to have caused massive clouds of dust suspended in the air that could have refracted sunlight. The volcanic particles in the atmosphere could have created an effect similar to what happens during sunsets. United States Geological Survey volcanologist Charles Mandeville has a more technical explanation of how the volcanic eruption could be responsible for the fiery skies depicted in The Scream. He says that fine ash and dust in the atmosphere tends to scatter blue-violet light and those that have shorter wavelengths. What goes through the ash and dust are the light with longer wavelengths, which are red, orange, and a little of yellow. Mandeville adds that there are actual eyewitness accounts of how the skies turned fiery red and orange during the Krakatoa eruption. The phenomenon was said to have lasted for a couple of weeks. These supposedly “real” reasons or inspirations for the creation of The Scream only make things confusing, thus allowing more people to believe that the Indonesian volcanic eruption cannot really be completely ruled out of the picture. The poem does not seem to be completely similar to what the diary entry narrates. Munch seems to have the habit of doing his works with several-year gaps. 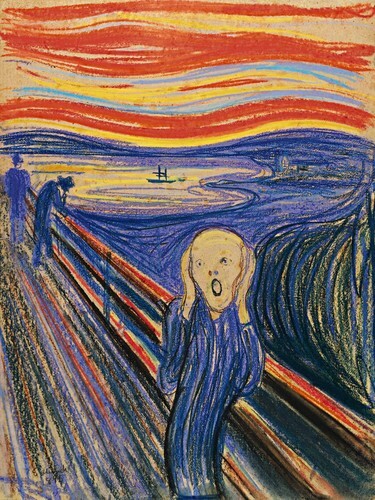 The three other versions of The Scream include a lithograph created in 1895, a pastel version also created in 1895, and another one executed in tempera on cardboard in 1910 (pictured below). Notice how it took Munch more than a decade to create another version of the famous painting. Some would opine that it’s not impossible that Munch had an original The Scream painted at the same year when the Indonesian volcano erupted. Art historians may argue that there was really no volcanic eruption involved in the painting, considering that Edvard Munch is an impressionist and was unlikely to be interested in literal visualizations of what was happening in nature. However, the possibility is still there unless it can be clearly established what Munch intentions really were. Of course, this is not a critical issue people should be bothered about. It’s not like art appreciation will be severely skewed by it. 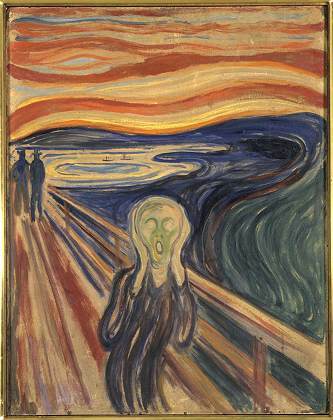 It’s just worth some time discussing the possible inspiration behind The Scream, especially the possibility that it was a tremendously enormous natural catastrophe that may have inspired one of the most expensive paintings of all time.